I've ordered from Scribble It! and was quite pleased with their product and their instructions for applying the vinyl decal. Here is a not-very-good picture of the vinyl I have in my family room...and yes, I know it is a bit too low! I love it anyhow. A project in the making! Last week I was reading My Romantic Home and noticed an adorable pedestal dish that she made--so cute and so easy! Coincidentally, I knew I would be in the vicinity of St. Vincent de Paul (Catholic thrift store) later in the week and in the past they've had some of the components necessary for constructing the pedestal dish--namely, a glass dome, glass plate, and glass candlestick. When the children and I arrived at St. Vincent de Paul, we first checked out the children's book section and picked up a number of deals there--they have the best deals on Golden Books! Then we went over to the small glassware section. I found two different cheese domes, but the first one had chips all along the edges and the second one had a 70s style design etched around it. Oh well. We wandered through a bit more of the store and then I wandered through the glassware section again--I found a cute set of Pier One bowls, but I didn't buy them, I was good!! I did, however, spot one more cheese dome that wasn't with the others. And, it wasn't chipped and wasn't festooned with 70s detailing! Success!! Of course I've already gone beyond the $3 that Cindy at My Romantic Home thought this project would cost and I haven't even found a glass plate or candlestick yet! 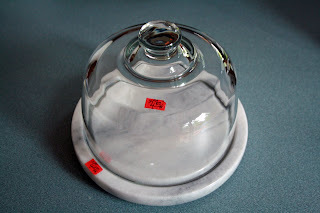 The cheese dome and marble base were $4.50. That's okay though, I didn't think the $3 was at all realistic for my area anyhow. The other week I brought a camera onto the field with me and was able to get a few pictures. 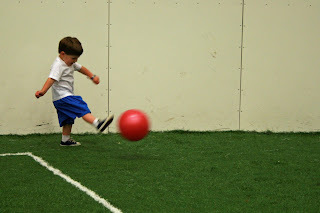 This next picture is of Handsome's favorite game at soccer. 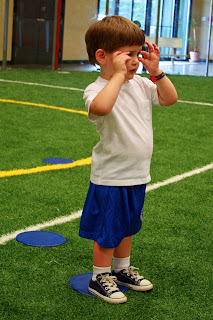 They put their hands up to make binoculars and look for sharks on the soccer field. He loooves doing this! It kind of makes up for when the coach tells him to sit on the field and he flatout refuses because he can't stand the feel of the artificial turf. He'll squat down but won't ever actually touch the ground with his skin. They both are so excited on soccer day. We'll definitely be continuing soccer beyond the summer. 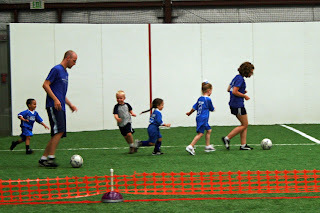 We're very fortunate that an indoor soccer facility was built just a few years ago in our small town, so we can participate in soccer year-round without being worried about the weather. 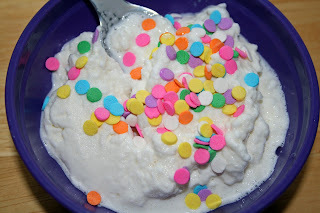 Combine the sugar, half-n-half, and vanilla in the pint size ziploc bag and seal tightly. 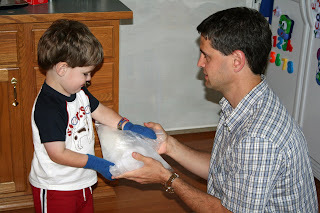 Combine the ice and rock salt in the large ziploc bag. Place the small bag inside of the larger bag and seal. Shake the bag until the mixture turns into ice cream! This takes about 5 minutes. I put mittens on Handsome and he helped a bit with the shaking, but mostly he liked to pat the bag while my husband did the shaking. After about five minutes we opened up the bags and found some soft-serve ice cream! Handsome opted to add sprinkles and happily ate up his ice cream that he "made all by me-self!" That bowl is one of those little Gerber plastic bowls and that is all the ice cream that was in the bag--just right for a child, I think. Handsome ate most of it, but a lot of it turned to liquid because he's kind of slow. Usually he doesn't like ice cream, but he really liked eating this. This is his favorite way to fall asleep although when I check on him at night before I go to bed, he usually has his feet pulled back in. For more Talk About Tuesday, visit Lara at The Lazy Organizer...or come read more of my blog! We had some good family time on Saturday--we needed to get out of the house as a family and make some memories that didn't revolve around yard work! 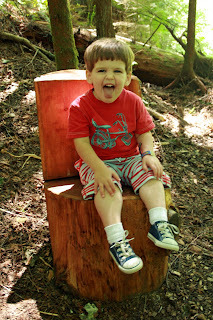 So, at the request of the two year old, we went out geocaching! 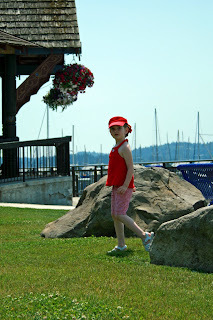 We call it treasure hunting in our house and both children LOVE it! 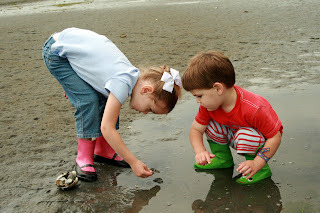 Our first stop was a beach where we put on our boots and explored the tide pools and the sand before heading down the beach a bit to find our first cache for the day. Oh it was sooooo much fun! Although this beach is only fifteen minutes from home, we've never been there before--but we definitely will be back!! 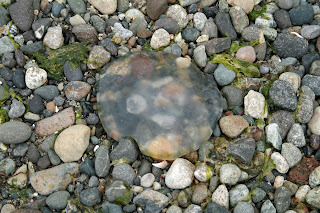 There were jellyfish all over the beach--oh and lots of teeny tiny crabs, too! It took us a few minutes to figure out what these are...they're geoduck siphons sticking up through the top of the sand. They were ALL over the place too. I think they're disgusting, but they're a delicacy in China! By the way, geoduck is pronounced "gooey-duck"...totally different than what a lot of people think. We also found a huge bed of living sand dollars. This was my first time seeing living sand dollars--I'm used to them being white and dried out. These were almost purple colored and had moving cilia on the bottom. Very neat! 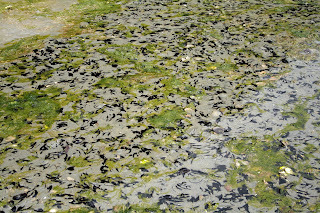 Check the picture out--there were hundreds of them! 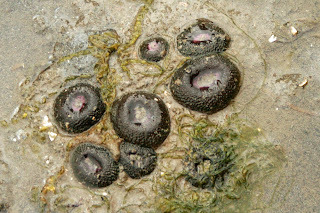 Everything purpley in the next picture is a sand dollar! 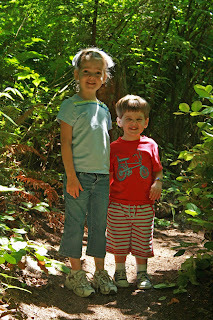 After we were done playing on the beach and finding our first cache, we moved on and found caches in more of a woodsy location. One of the places we went was a great trail system. The children loved this as well--nice wide trails for them to roam down and it was a half-mile loop, so we easily ended up back where we started. 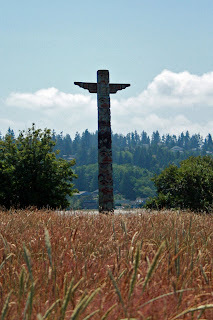 It was a gorgeous location that we wouldn't have known about if it weren't for geocaching. 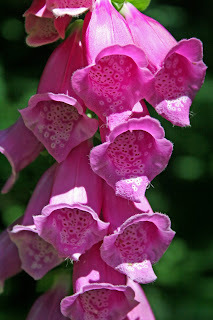 There were beautiful wildflowers along the trail, especially lots of tall foxgloves. We made one more stop before heading home and it was another beautiful location...unfortunately my camera battery died and I didn't get to take as many pictures as usual...but I did get this one! 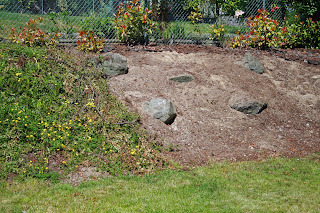 This summer our big yard project has been working on the hillside between our neighbor's house and our house. The neighbors who used to live there put in a chainlink fence--yuck! We are NOT fans of chainlink! So, we have that eyesore to deal with...such a pity since the rear of our yard backs onto a greenbelt and on the other side of our yard we have trees (and a few sticker bushes...) between us and the other neighbors. Anyhow, a couple of years ago we planted photinia at the top of our hillside in order to have a quick-growing hedge to hide the unattractive chainlink. In the meantime we've been trying to manange the groundcover and assorted plants the previous owners of our home planted. Well, it has been a losing battle--the groundcover was out of control and we couldn't get through the groundcover to get to the roots of the weeds that were growing through...in short, it was a MESS! So, our solution is to rip out everything except the photinia. We're about halfway done with the length of the hillside and it is looking better already! We're exposing all sorts of small boulders that previously were hidden under the mess. We're going to put down landscape cloth and bark and probably some rhodies. It will be SO much easier to maintain and will look so much better than the mess we have been dealing with for five years. 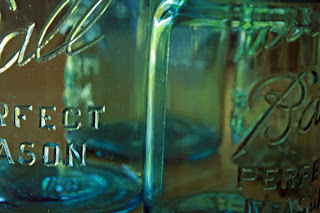 I've started picking up these vintage mason/bell canning jars because I just love the aqua hue of the glass. I bought two from St. Vincent de Paul (Catholic thrift store) and bought two (including the smaller one) at an antique fair a few weeks ago. They have zinc lids and just are so pretty! I don't really know what I'm going to do with them, although I have lots of ideas running through my head. The small one would be pretty with a candle inside, especially if I was able to pick up a few more in that size--although supposedly that size is more desirable and thus harder to find...or so I've been told. 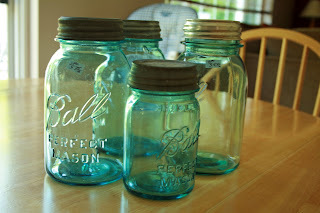 I like the idea of tying ribbons around the necks of the jars and using them as a centerpiece. And of course they would make pretty vases for some flowers from the yard. Look at the color--so pretty!! I turned to Google for ideas and found quite a few--most of which centered around turning the jars into lamps, lights, drinking vessels, and soap dispensers...none of which really interest me. If I had more room on my counters, I think I would fill the jars with noodles and whatnot and actually *use* them rather than just display them...but my kitchen isn't big enough for that. So, for now I just keep them and bring them out occasionally to admire them gleaming in the light. Hopefully by fall I'll figure out something to do with them--they just seem so "fall" to me for some reason! Look what I found at a garage sale a few weeks ago! A solid wood Bassett dresser for $15--I almost felt guilty for convincing them to take $13 for it. It is so heavy--definitely a lot of wood! I've started sanding it down--it needs a LOT of sanding--and eventually will be painting it black. I'm going to use it as a sofa table in my family room and can't wait to have the extra storage as well as a place to put a lamp. I already bought new silver colored knobs for it. 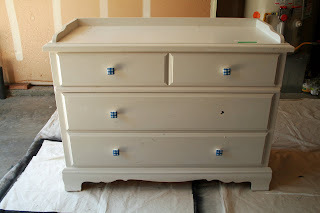 That's just drawer liner on the inside, but it's pretty cute and matched the knobs the previous owner put on the dresser. I'll be changing the liner out too though. The drawers glide beautifully! I'm so pleased with this find. I've been stalking Craigslist for months looking for a dresser or table for this spot and haven't had any luck at all. 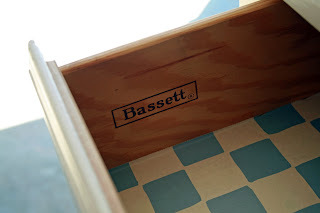 At one point I found a black dresser for $75, but when I showed up at the woman's house, I about keeled over from all the cigarette smoke in there--I was relieved when I found a hole in one of the drawers because there was NO WAY I could have bought that dresser! I never go garage saling, but opted to go out one Saturday morning a few weeks ago--and found the perfect item at a fantastic price. We need more storage, so this is perfect! 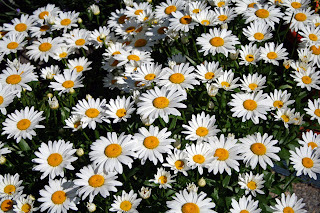 My daisies are looking gorgeous these days!! I just have to share them--I wish they bloomed more than once a season because I love seeing them. 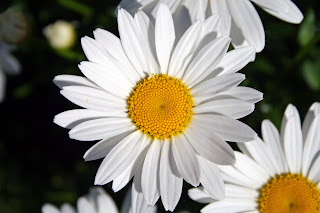 They look especially lovely as the sun begins to set and evening shadows take over the garden--the white of the petals just gleams so brightly then. 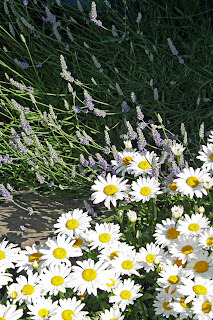 Look at this one daisy bush--I took this picture this morning of the bush right by my front steps. This started off as a one gallon plant four years ago and look at it now! HUGE!! Love it! I have two lavender plants right behind that big daisy plant and the lavender just is starting to bloom. Mmmm, soon the area by my front door will smell so nice! These are my Endless Summer Hydrangeas (I think I have five of them) in the backyard along the side of the house. 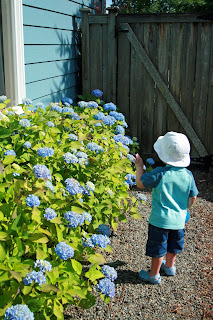 Yesterday afternoon I pried my two year old away from the water table long enough to get him to stand next to the flowers--look, the hydrangeas are taller than he is!! When we moved into this house, the previous owners had planted five or six coniferous trees along the side of the house. Those were such a pain to rip out, but they didn't look good, plus it wasn't a very smart spot to plant trees--they were growing into the side of the house and into the roofline up above. However, when I planted these hydrangeas, I didn't realize they would get quite this big! Ooops! Here is an updated view of my vegetable garden. It has grown so much since the end of May...but we still haven't harvested *anything*!! Aaaaahhh!! Actually, I think the romaine might be ready to harvest, but that is it! My tomato plants are big and leafy, but the Roma tomatoes (on the left) have no tomatoes and the Early Girl plants on the right are HUGE and have some green tomatoes--but the little tomatoes haven't grown at all in weeks. 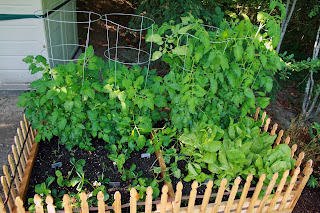 Of course it doesn't help that the little tomatoes now are being shade by the huge plants. Why did the tomatoes have to grow on the *back* side of the plants! 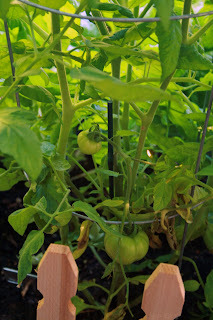 Granted, we have had a cold wet spring and early summer and I did plant everything a bit late for this area...but the weather has been gorgeous for awhile now and my little garden gets plenty of water. I want to harvest my garden!! Anyone have any advice? Check out Lara at The Lazy Organizer for more "Talk About Tuesday"--she's talking about organizing this week. We had another Muffin Tin lunch the other day. My little ones were so excited to see the tins come out again! And, as a bonus for me--the tins bought me 45 minutes of contented munching from my children! Ahhh, nice!! I made one for each child and each child ate almost everything. I'm still kind of carb heavy when filling up these tins though...I need to work on that. Head on over to Sycamore Stirrings for more muffin tin lunches--and check out her pretty orange muffin tin! So cute! The other day when I posted pictures of my daughter's bedroom, I mentioned that most toys are kept downstairs in the family room. 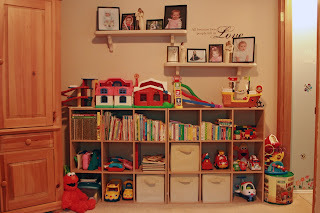 I thought today I'd share pictures of some of our family room toy storage. My biggest area for toy storage is this wall of cubbies. These are two sets of cubbies from Target--I think they're meant for closet storage. Anyhow, I put these up in early January and they have made my life so much easier! I feel like we have a lot of toys, probably because Handsome still likes a lot of babyish toys whereas Princess is into toys for preschoolers. And of course we have our ever-growing collection of books. We have books everywhere in this house! You can see that five of the cubbies are taken up by books. The last spot on the top row has two different wooden trains. On the second row we have: doctors kits and tool kit, toy phones and princess mirrors, wooden puzzles, bin with "My Friend" doll clothes (my old doll clothes! 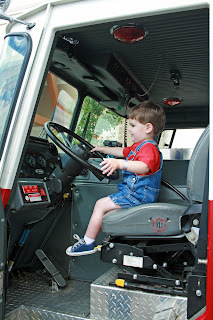 ), two toy firetrucks; toy trucks and truck flashlight. In the third row we have: box with Snap n Style dolls/clothes (with library books stored on top of the box), toy bus and construction vehicle, bin with Leappad books, bin with baby toys, bin with blankies, and a toy airplane. 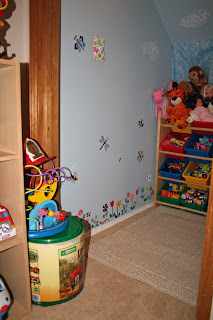 The Leappad is stored in the gap between the armoire (which houses the television and electronics), and large Little People toys are stored on top of the cubbies. Lincoln Logs are in the big container to the right with a bead maze and firehats stored on top of the container. 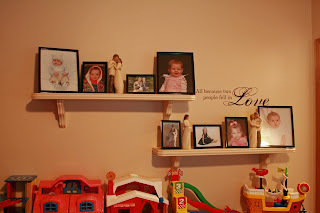 Here are the family pictures I have displayed on shelves above the toy storage. These are the only color pictures I have displayed in the house. I just recently put the vinyl lettering up and I love it--except I put it up a couple of inches too low!! Ugh! I know I *could* rearrange the frames, but I like this arrangement. So I'm living with this for now until I decide just how much it all bothers me. Oh and the wall shelves? They were free--well, either that or the world's most expensive shelves...I guess it depends on your perspective. The previous home owners left them behind and I stashed them in a closet for a couple of years before repainting them and rehanging them. Or another view on the shelves is that they cost us a plumbing project. See, when the previous home owners put those shelves up, they put a screw right through a PVC water pipe in the wall--a mistake that nobody knew about until awhile AFTER we took the shelves down--when I felt the carpet near the wall and realized it was soaked!! Luckily the wall backs onto the garage, so my handy husband cut a huge hole in the wall, cut out and replaced the section of pipe, and I bleached the entire cavity to kill off any mold that was growing. Apparently removing that screw was equivalent to removing a plug and thus water sprayed out of the hole when we ran water in the upstairs bathrooms. Okay, back to toy storage! To the right of those cubbies is a little coat closet tucked under the stairs. We didn't use it (except for stuffing it with unused stuff!) for a couple of years and then jamming the train table in front of it to keep Princess from exploring the junk we had stuffed in there. Then 1.5 years ago I had the idea to use that space for playing! We took the door off (another one of those icky oak hollow-core doors...thus the oak trim around the door frame) and my husband removed the pullstring light fixture and did the electrical work necessary to put in a regular light with a lightswitch. 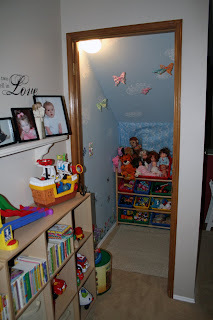 I painted the closet up and added in a toy shelf and a rug (to hide the access panel in the floor that leads to our crawl space) and then we revealed it to the children--they had no clue (well, Handsome was a baby then!) what we had been working on. Princess was so excited and for quite awhile they spent a lot of time playing in there. Lately they haven't spent as much time in the closet playing, so I'm thinking of turning it into a reading nook and moving all of the downstairs books in there and putting some big floor pillows in there. I'm still pondering that though. I think once they outgrow the toy closet completely, I'll turn it into my little office and put a little desk in there for me. Maybe next week I'll post the before/after pictures of the toy closet. 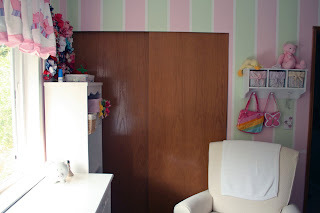 It was a dreary unused space before and now it is so bright and cheerful! You can't see the toy closet at all until you're all the way in our (fairly small) family room, so it is a great surprise for children who come over to play. We do have more toys, but this is all the pictures I have for now. Some days it is the simple things in life that make me smile. 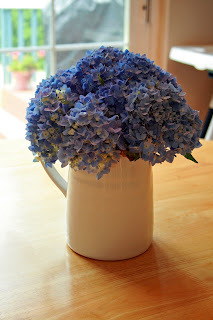 These hydrangeas are from my garden and I put them in a basic white pitcher. So simple and so pretty. They perk up my entire kitchen and bring a bit of summer inside. Yes, that's right, we are going to DISNEYLAND!!! I'm so excited! I made our hotel reservations in January (found a great deal) and kept my fingers crossed that we'd actually be able to make the trip in September. Yesterday I found great airfare prices that I was afraid would disappear quickly, so we had a long discussion last night about finances and whether or not this trip would happen. Obviously we decided to go ahead with it. We are so excited! We're going from September 16th-20th and spending three days actually in the parks--the other two days are for travel and looking through Downtown Disney (shopping). Princess will be so thrilled! One of her good friends from preschool went last year and Princess keeps mentioning that we should "go there someday." Oh what a wonderful surprise this will be! I can hardly believe it is just two months away! My babies are so gosh darn cute, I just have to write down some of their latest things so that I have them for posterity. This will be a random list, so be forewarned! Both my children have allergies to animals and I detest creepy-crawly things. Needless to say, we don't have any pets. Well, last week I was eavesdropping on my children as they were playing in the yard and realized they were playing with a slug. (Gross, I know!!) Anyhow, they were carting the slug around the backyard on a large leaf and calling it their pet. Hilarious and gross at the same time. The kicker was when they sent the slug (on its leaf) down the slide! Now everytime they go out in the backyard, they find a slug to be their pet. It's so funny and yet kind of sad at the same time. Last night Princess was singing to herself in bed after she went to bed. It was sooo cute! She was singing "Halleluia" for awhile and then she switched to "Christ is Risen, Christ is died, Christ will come again." Yes, a little bit backward, but absolutely adorable nonetheless! Even better was that she was singing it over and over again. Totally hilarious! And, no list of anecdotes is complete without a potty reference. Handsome is in diapers fulltime still but uses the potty on occasion--we're not doing potty learning yet though although I think he's almost ready. 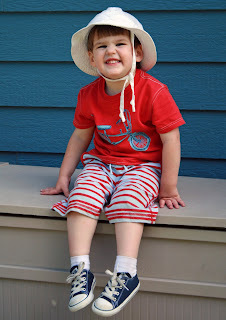 Anyhow, he wanted to use the potty the other day and almost immediately pushed out a poo-poo. After telling me all about it ("did ONE poo-poo, Mama), he proceeded to push out another one--at which point he said "made poo-poo FRIEND!!" So cute and definitely gave me a chuckle! After you leave me a comment (just click on the "bees buzzed by" link at the end of this post! ), head on over to The Lazy Organizer for more "Talk About Tuesday"! The other day the children and I were driving home and I made an impromptu stop at a local-ish strawberry farm and bought half a flat of fresh strawberries. 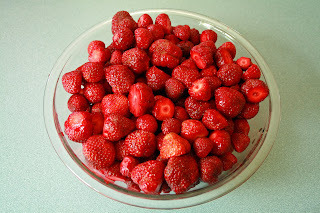 Store-bought strawberries have nothing on fresh local berries; berries that were in the field just a few hours ago. I adore strawberries which, I suppose, is fitting for a former Strawberry Festival Queen. My husband tells our little girl that she is a princess but Mama is a real Queen. The first time I showed her my tiara her eyes got as huge as saucers and she said "Mama, you really ARE a queen!!" Oh it was priceless!! I knew I hung onto that gaudy tiara for a reason! Anyhow, these strawberries were so yummy! I spent all of naptime cleaning them and then the bowl of red berries was so gorgeous, I just had to take a picture! Blend and drink!! This serves at least four people and could serve more depending on the size of your servings. 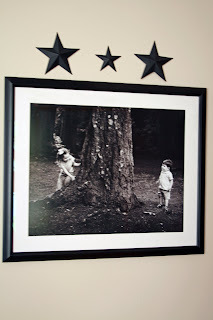 I loved it and so did my husband and my 4 year old. 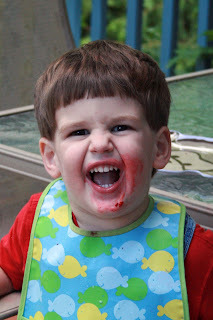 My 2 year old doesn't like ice cream (or chocolate...crazy boy!) and thus didn't really like this...which left more for me! 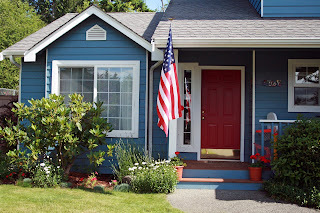 We're having a quiet 4th of July at home. 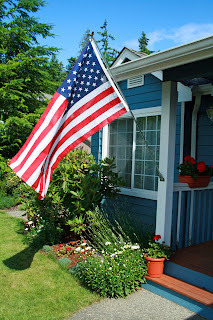 Our flag is flying out front and we're wearing our red white and blue. No fireworks or anything fancy though. As a matter of fact, we put the children down at the usual time and skip fireworks altogether. They're early risers regardless of when they go to bed and they don't even know what fireworks are...so they're not at all upset to go to bed at their usual time. 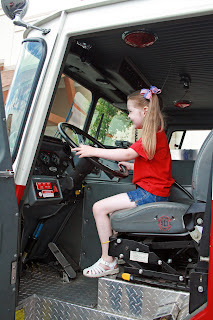 We did, however, make a trip to Home Depot to see the firetruck, ambulance, and fire boat that were visiting there today. Those were huge hits, of course, especially with Handsome!! In my quest to make lunchtime more interesting (I get tired of making the same things even thought the children don't get tired of eating!! ), I remembered something I read about a long time ago--serving lunch in a muffin tin. 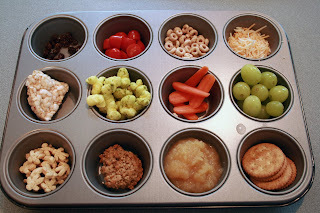 Then, I found a blog that sponsors a muffin tin lunchfest! So, one day last week we had a muffin tin lunch. The children were thrilled to eat out of "circles" as they called it. 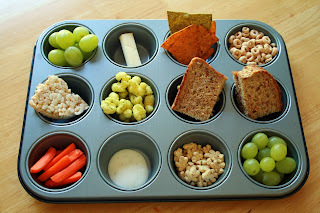 My children eat a fair amount at lunch so I made each of them a muffin tin and they each ate almost all of their food. As predicted, my 4 year old didn't finish her carrots and my 2 year old didn't finish his tomatoes. I was pleased, however, that neither started their meal with a cookie--my daughter started with the rice cake and my son started with the whole wheat crackers. Definitely a big hit and something we will do again! 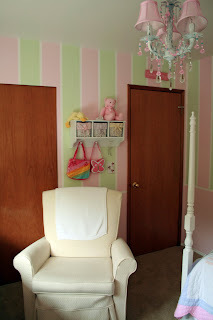 Today on Talk About Tuesday over at the Lazy Organizer, it is a home tour where people pick one space in their house to talk about. 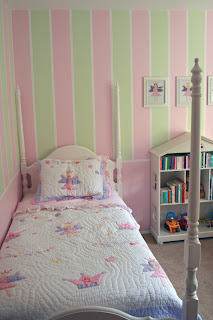 Without further ado, here is the bedroom my little princess sleeps in. 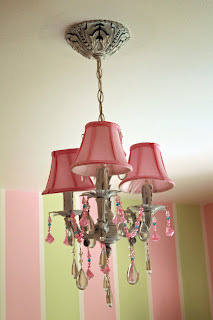 It is pink and green and very girly--I love it and so does she! Her white four poster bed was my bed when I was growing up and I just love that. Her name is done with wall letters along the length of her bed (not pictured) and then I'm planning on doing a rag garland on the wall at the head of her bed. You'll notice there aren't a lot of toys in her room, mostly it is books. The children spend most of their time playing downstairs, so that is where the toys mostly are located. 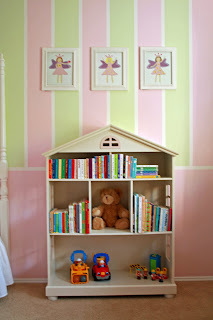 However we have a LOT of children's books so those are spread throughout the bedrooms as well as downstairs. 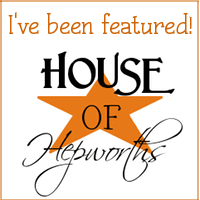 Her dollhouse bookcase and traditional bookcases are from Target and I love them! When she is older, we'll probably replace the dollhouse bookcase with a desk. Her long dresser is one that we bought for her before she was born. When she was a baby we had a changing pad on it, but now it is pretty empty. We still have a diaper pail in her room because it makes a great garbage can that her little brother can't open! 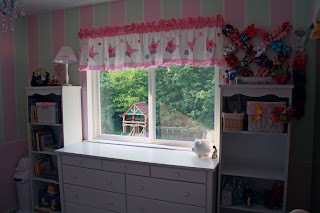 Oh and yes, those are some of her bows to the right of the window--she has more inside the big basket on her bookshelf. Our long range plan for the house includes replacing all of the oak hollowcore doors with white six panel doors--but for now we have oak. I am so NOT an oak person! I love my Dutalier glider! 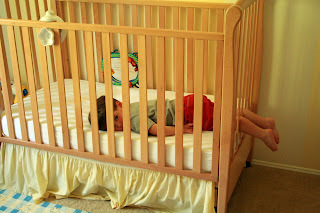 I used it all the time when Princess was a baby and she's still rocked in it every night before bedtime. 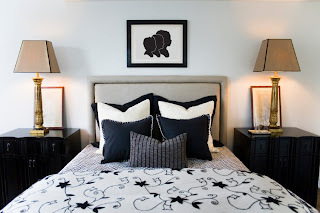 Handsome has an identical one in his bedroom--someday my husband and I intend to reclaim them and use them for ourselves (that's why they match and are in a neutral fabric). No photo tour of this room is complete without a look at the chandelier! I looked all over before I found this one and I *love* it! It is so over-the-top girly! 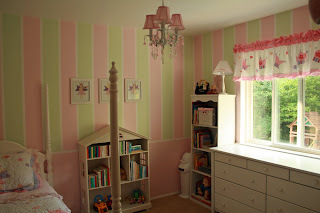 When I first took it out of the box I was worried it was *too* girly, but it really works in this room and my daughter loves it!